The river acts as a funnel, giving fisherman ample opportunity at battling one of these great specimens. To a salmon die-hard, the fall season brings great joy. Thousands of large chinook wind down their life long journey and venture upstream to spawn, completing one of natures most amazing life cycles. The river angler follows a cycle of his own, strategically placing himself on different bodies of water throughout the season, trying to optimize his chances of hooking that life-long trophy. As a die-hard myself, I endure the long, dry summer anticipating the first fall rains. The slow but definite transition of seasons in British Columbia brings an array of rich colors, replacing the usual deep green landscape with vibrant bursts of reds and oranges. Mother natures artful display also triggers the Pacific salmons instincts; a keen sense of smell draws them to their freshwater birthplaces and the final lap of their life-long race. If you were to rate British Columbias trophy fish, the chinook salmon would probably top your list. For more than one hundred years, anglers have traveled endless distances at great expense to battle this king of the salmonid species. From the angler who frequents the most extravagant lodges to the basic weekend spin-caster, the thrill of hooking one of these great fish is the same. One warm morning last October, a couple of friends and I ventured to one of my favourite Vancouver Island chinook salmon rivers. With old growth cedars and brilliantly colored maples lining the trail, we told fish stories of years past and worked our way to the stream. Previously sampling these waters in earlier years, we thought we would have the upper hand by knowing where the salmon would be and what these sometimes spooky fish would be most susceptible to taking. As with most fishing, we were wrong. The first pool we came across held a few chinooks, but a large black bear had already staked his claim and was not about to share. We proceeded on to other pools and, after brisk hike upstream, (a 300 lb. black bear behind you somehow makes you pick up the pace) we came to a slow, deep pool. There was a log jam for cover and a small patch of rapids at the pools head; ideal conditions for this small river. Peering into the pool, we saw numerous, large shadows lurking in the light green water. There must have been fifty chinook ranging from 20 to 40 plus pounds. After seeing that, we had a hard enough time tying knots let alone deciding on who would get the first cast. Mark Pavesic rigged up and tossed his green wool, bottom-bouncing setup into the pool. The salmon swam by his presentation, seemingly unaware of the lure that lie just a foot below them. I am a teelheader at heart, so my rig mirrored Marks, but with a float. Frustrated, Mark gave up after a few casts and let me have a crack at the ill-tempered salmon that lay in front of us. After adjusting my float to match the depth of the fish, I placed my first cast at the head of the pool and watched as my gear made its slow journey toward the school of chinook. As I viewed that six-inch piece of foam, I detected a slight hesitation and set the hook. I was pleased to feel a savage tug on the other end of the line and held on as the chinook leaped like a tarpon. Due to a relatively light river current, my gear choice was just right to subdue the salmon in a ten minutes. It was a strong fish of 25 pounds or so, with light, crimson colours covering its body. A nice fish in my books. Soon, Mark was rifling through his vest for a float of his own. Quickly adding this new weapon to his arsenal, he quickly tied into a large chinook himself. The madness went on for hours, fresh school of salmon after another to pushed into the hole. Cast after cast, the fish struck all day. The key was in presenting our lures at the proper depth. The chinook salmon in this river tend to hold just off the bottom. Therefore, we adjusted our rigs to match the depths the salmon were held at. Tackle used for these river brutes must be able to handle extreme strain. I have seen moderate-sized chinook blow the gear in reels, explode steelhead rods like they were twigs, and snap 20 pound test with one good head shake. With that in mind, premium gear in top working order is essential. My personal favorite set-up consists of a 10 6 medium action rod with plenty of backbone to steer these largeish, but with a sensitive enough tip to detect the sometimes soft takes. A reel with a smooth drag and a large line capacity (able to hold at least 150 yards of 15-lb test) is a must because of the freight train runs the chinook are famous for. The lines I personally prefer are the new braided lines now available on the market. 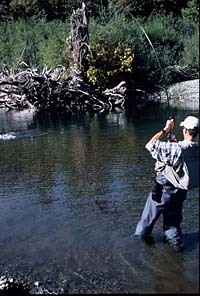 Most British Columbia rivers that hold chinook usually host numerous stumps, submerged branches, and other obstructions that large chinook salmon love to hide under. These lines can save the day when that occurs, due to the incredibly high abrasion resistance that most monofillament lines lack and a no stretch factor that allows for a more sensitive feel and a more solid hook set. For the pork n beans of the gear, a basic steelhead float system works wonders. A foam float, a weight and wool on a hook is all you need. Due to numerous bait bans, anglers are having to adapt to alternative methods. Widely available and inexpensive, wool is a great substitute for traditional methods, and with proper presentation can work just as well. Color combinations can vary from day-to-day, but reds, greens, and oranges are always a good bet when placed on a size 1 to a 3/0 hook. Over the years, traditional steelhead gear has worked its way into chinook fishermans vests. Corkies, Spin & glos and Gooey bobs are also a great substitute for bait and I have found chinook will readily take them on a daily basis. Dont be afraid to mix and match sizes and colors until you find what works for your self remembering that there is no need to  match the hatch here. Chinook salmon tend to be found in medium to large river systems. Over the years, rivers like the Fraser, Skeena, Kitimat and Alaskas Kenai (home to the current rod-caught world record 97 pounds 4 ounces) have been found to produce larger fish, or host larger runs than others, but due to the size, offer limited opportunities to the bank fisherman. Many of these rivers smaller tributaries offer the same fishing benefits, but with the ease of bank fishing. Local tackle shops in these areas will have up-to-the-minute information on the rivers, run sizes, and which have been producing most consistently. The best months for chinook fishing vary from location to location. Because of their migration route from Alaska downward, the farther north the river lies, the earlier the run. As with everything, there are plenty of exceptions to this rule, but for the most part, I have found this to be true. Alaska hosts healthy run sizes from mid-May through late June, while Vancouver Island and lower mainland British Columbia tend to receive the bulk of chinook in September through October span. Wheres the next world record chinook? which river will host the next world record?